Come explore magic of your own creating as you become familiar and probe the wonderful world of Gelli Arts. Guided by award-winning artist and instructor, Aleta Jacobson, you will begin your weekend with an immersive arts experience, using Gelli Arts Printing Plates to create art prints that are uniquely your own. You will learn the ins-and-outs of using a Gelli Plate and create colorful prints on paper and fabric using stencils, feathers, string, mark-making tools, customized stamps, and hand cut masks. Each technique will be an exercise in self-discovery and risk-taking as you learn to layer objects onto your prints to form unique, expressive images that will be bound together in a handmade, fabric–bound art book of your choice. Then, Aleta will show you how to use washi tape, stickers, and ephemera to turn your book into its own work of art. Aleta Jacobson is an award-winning collage, acrylic, and mixed-media artist living and working in Southern California. Jacobson's love for artistic expression developed at an early age. The child of a highly creative family, she grew up creating artwork for friends and family. Madeleine's Paste Papers are a unique creation and a brilliant way to add a fresh and original look to your creative book art, collage, and calligraphy creations. In this one-day workshop you will learn the brush technique that Madeleine has developed over the last many years. You will learn what kind of brush works best and how to hold it so that you create a variety of lines, shapes, and patterns. You will also learn tricks for blending colors. You will leave the class with a basic knowledge and ability to create straight lines, wavy lines, subtle blending techniques and geometric patterns. We will dive into painting with paste right away with simple lines and colors and quickly proceed to more complex patterns, colors and fun magical techniques. Madeleine's paste paper technique is delightfully spontaneous. All levels welcome. Come to class ready to have fun! You may want to consider coming for both sessions to learn even more and perfect the techniques you learned on the first day. Madeleine Durham is a paste paper artist who shows her work in her hometown of Santa Fe, NM and around the country. She travels to many shows including the annual Guild of Book Workers Standards Conference, the International Calligraphy Conference, and Codex. Her papers lend themselves well to many applications including fine bookbinding, calligraphy, book art, and collage. Madeleine has produced special-edition work for Nawakum Press, Palace Press, Flea Circus Press, and one of the top three social media platforms. Her work has been used in one-of-a-kind books by Don Etherington and Monique Lallier, among many others. Her papers can also be found in the collections of the Watson Library at the MET, North Bennet Street School, The American Academy of Bookbinding, and the Morgan Conservatory. Madeleine can be reached by email. Visit her website at www.madeleinedurham.com. Other prerequisites: Some experience with cutting paper with X-acto knife and sewing by hand would be very useful. In this class, students will learn the basics of combining cut paper and embroidery to make marks and shapes, add color and texture - to design a narrative. Cutting paper is like drawing and adding embroidery with thread can be like painting. We will do several exercises to learn simple stitches on paper and then do a collaborative project where the collective story will be made of several smaller and personal stories. Some experience with cutting paper with X-acto knife and sewing by hand would be very useful. San Diego native, Al Rodríguez, is a retired school teacher who taught graphic arts and photography in the San Diego City Schools. His life long interest in paper and printing lead naturally into book arts; an art form that he taught to his students during the last five years of his teaching career. ﻿Students will learn how to design unique and original Christmas/Holiday greeting cards. Two designs for cards will be taught and students may create additional cards as time permits. This class introduces card making techniques and approaches, which apply to quality card production with students utilizing their innate creative abilities. The EEP Deadline has passed. Please choose another option. A native of San Diego, CA, Doria has operated her own business, Designs by Doria for 37 years. She began her career designing wearable art and limited edition clothing that was marketed wholesale and retail throughout the United States. In 1995, Doria began designing art quilts for home and office decor. Her art quilts have been juried into national and international exhibitions and have received numerous awards. Her designs have been published in books and magazines. She also designs art books and her paper products are sold in museum and gallery gift shops. View her fiber and paper art at www.designsbydoria.com. Materials fee: None, all materials supplied by Josie. Wear comfy old clothes and shoes. Bring your lunch. If you have an old apron, bring it. Josie has some extras. Explore the magical world of encaustic painting and discover a lost art that has captivated painters for over 2000 years. The transparent and luminous effects of encaustic are often what captures the attention of artists. Encaustic means to “burn or heat” and comes from the Greek, enkaustikos. During this 6 hour class, you will learn the basics of encaustic painting, including history, safe practices, use of equipment and tools, building smooth and textured surfaces, photo transfer, carving and incising, layering and collage. Demonstration of techniques will be followed by practice, and you will leave at the end of the day with many examples of your own work. Josie Rodriguez, visual artist from San Diego has worked with the medium of encaustic for the past twelve years. Josie enjoys teaching others the art and process of encaustic from her home studio and venues on the West Coast and can proudly say that she has jump-started the careers of several emerging encaustic artists. She recently exhibited with a group of three women artists at Front Porch Gallery in March 2018 and has been invited to show her sculptures and assemblage at Encinitas Library, October 2018. The flatness of paper will serve as an inviting platform for transformation. Students will explore cutting, folding and manipulating paper. We will begin with simple exercises which, when put together, will start to expand the medium of paper into objects and wearables. Paying attention to color, shape, pattern and texture, students will focus on the process of taking an idea and visually translating it. Experience with paper cutting is helpful, but not required. Note: If students take both Saturday and Sunday workshops they will be able to keep their waterbath, all paints, and workspace for the duration, thereby cutting combined materials fee to $45, instead of $55, for the two days. For experienced marblers or those who have taken Introduction to Paper Marbling. This class will provide students with all they need to immerse themselves in a full day of marbling. With no lecture period, the day can be fully dedicated to practicing more complex and difficult patterns such as the Moire, Spanish Wave, and Double cables, or exploring the limitless possibilities in spontaneous design, combining color, or wherever the imagination might lead. Pietro will provide metallic paints and a diverse array of different colored and textured papers with which to experiment. Students are also free to bring any materials they might wish to play with. This is a full day of marbling to deepen our practice and knowledge. Though students will be set free to marble at will, Pietro and his wife Vanessa will be available at all times for consultation and help with the practice. All materials will be provided. Bring an apron. Please note that paper marbling is a wet process and papers made at the workshop may not be dry at the end of class. Pietro Accardi is native to the northwestern Italian city of Turin where his father Gaetano founded and operated “Tipografia Accardi.” In 1950s Italy, it was a state of the art printing press. 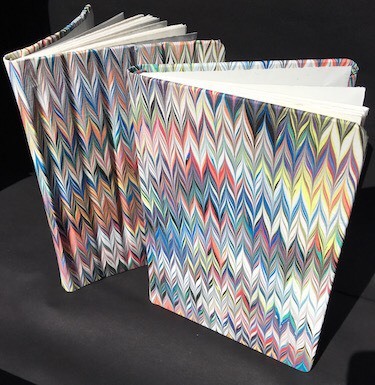 His youth spent in the press lead him to paper marbling, restoration and bookbinding. Pietro moved on from his father’s press to establish “La Legatoria del Sole,” an artisanal and production-oriented bookbindery in Turin. It served Turin's Municipal Archives, public and university libraries. He now teaches at the San Francisco Center for the Book, Nevada Museum of Art, and Castle in the Air in Berkeley, CA. Together with his wife Vanessa he has founded Accardi Book Arts, a book arts studio and bindery. www.accardibookarts.com. This workshop is for new students and for those who have prior marbling experience or have taken the introductory class. The skills learned in Paper Marbling will be applied to Marbling on Fabric, while familiarizing students with new materials. We will discuss techniques and tips needed to successfully marble on fabric, choosing the best fabric for marbling, and how to prepare it for the dyeing process. New, more complex patterns will be demonstrated and attention will be given to important nuances in the practice. The main focus will be marbling on fabric to create bookcloth, but techniques for other textile uses will also be discussed. During the afternoon of guided and personal practice, students will create their own stack of 12-15 marbled fabric pieces. Paper will also be provided for those who wish to practice. Pietro’s wife Vanessa will also be available for guidance. All materials will be provided. Bring an apron. Please note that paper marbling is a wet process and papers made at the workshop may not be dry at the end of class. This introduction to the art of marbling will provide students with an understanding of the history, styles, tools and techniques of classical European marbling. Morning discussion will cover all the foundational elements of marbling practice, including acquisition and proper use of the supplies including carrageenan, primer, paints, trays, rakes, combs, etc. During the discussion students will also be engaged in the preparatory mixing of the water medium in their own tray. Pietro will then demonstrate to the class how marbling is done. 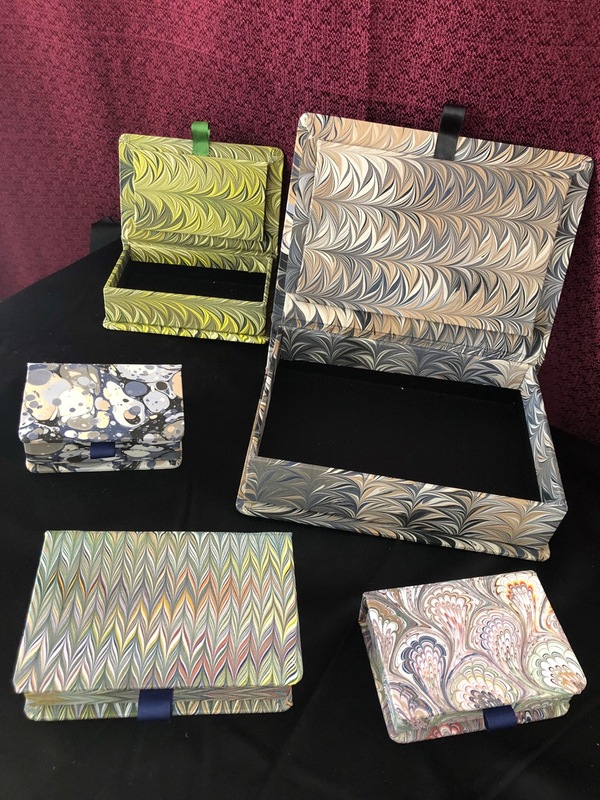 With helpful instruction on handling paints on the water medium, dealing with known and unknown variables, he will show how to create classical and basic marbling patterns (as well as spontaneous designs) using a diverse array of rakes and combs. After a break for lunch, students will have ample time for their own practice and experimentation with personal guidance from Pietro and his wife Vanessa. Students will have their own trays, set of paints, rakes, combs and as much primed paper as they need. Students usually leave with 15-25 of their own original marbled pieces. All materials will be provided. Bring an apron. Please note that paper marbling is a wet process and papers made at the workshop may not be dry at the end of class. On the first day you will paint a “story” and then deconstruct the pages to be the inside of the book. It is a process Jill calls “isolating preciousness” since in the end the cut up pages are even more beautiful than the whole. You will then create a sacred space for your abstracted and intimate stories in this layered artist book. Enter the space through a carved copper door, wander through illustrated spreads and create a small altar of offerings. Make this hardcover cathedral book while also learning new techniques with copper, clay, paint finishes and framed illustrations. This book was featured in 1,000 Artists' Books: Exploring the Book as Art by Peter and Donna Thomas. In this 1-day workshop, students will learn to sew over a dozen historic supported sewing styles on a single book. We’ll begin by sewing over cord, alum taw, and split leather. In this portion, we’ll experiment with both raised and recessed supports, as well as packing and sewing variants, including the isolated pack and weave and blanket stitch. Next, we’ll cover later styles such as sewing over tapes and Ramieband, including decorative variants, and discuss in depth the history of binding and the timeline of developments that gave rise to each sewing style. Pietro is native to the northwestern Italian city of Turin where his father Gaetano founded and operated "Tipografia Accardi." In 1950s Italy, it was a state of the art printing press. His youth spent in the press lead him to paper marbling, restoration and bookbinding. Pietro moved on from his father’s press to establish "La Legatoria del Sole," an artisanal and production-oriented bookbindery in Turin. It served Turin's Municipal Archives, public and university libraries. He now teaches at the San Francisco Center for the Book, Nevada Museum of Art, and Castle in the Air in Berkeley, CA. Together with his wife Vanessa he has founded Accardi Book Arts, a book arts studio and bindery now specializing in Marbled textile arts. On January 15th, students will mix a new bath of water. They will experiment with more complex patterns, learning the intriguing possibilities of Over Marbling with metallic paints. Students may also choose to do regular marbling. Ginger has designed several folded book structures with different holiday content for students to use as they’d like. During the workshop participants will make these and more samples. She'll also provide templates for Microsoft Word, Adobe Illustrator, and Google Docs so that the students can create their own designs after the class. If you go to Ginger's blog https://blog.gingerburrell.com/ and type in “free” in the search box you’ll get a whole list of cut and fold books to print and make yourself. Early Enrollment is closed. Please choose another registration option. Day one of this two-day workshop will focus on single-sheet bindings, with specific lessons on X cut, T cut and Z cut books, as well as Flutter Fold, Maze Book with Accordion, Ram’s Horn, and Secret Garden variations allowing a single piece of paper to transform into multiple connected pages. On the second day, we’ll make folded books with hard covers, beginning with a Crown Binding, allowing flexibility to easily add and remove pages, and end with an accordion book with Folded Frames, to drop-in photos and memorabilia. This is a great way to showcase content that you don’t want to glue in. You’ll leave class with several sample books and illustrated step-by-step instructions so that you can make the book structures again. Since we’re coming up on the holidays, we’ll talk about the terrific uses for both Flag and Tunnel Books as holiday gifts and as display items. Each offers the opportunity for a lot of personalization with photographs, images, stories, memories, favorite poems and holiday songs. 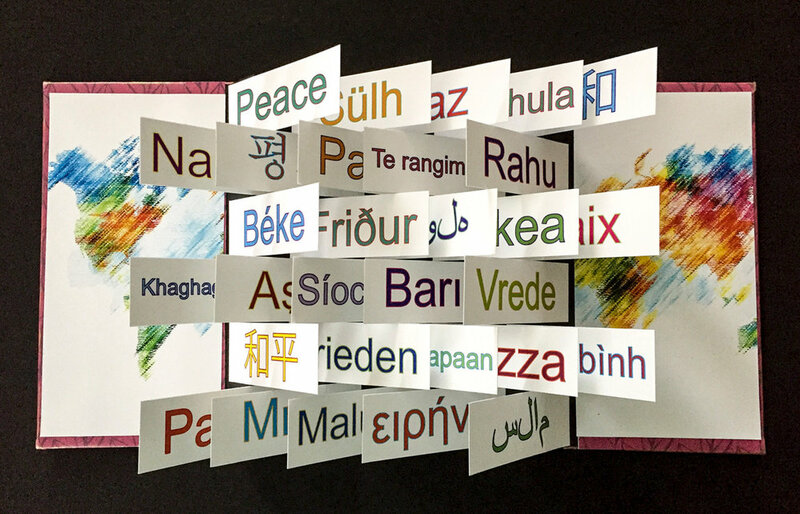 The Flag Book we’re making in the workshop will have the theme of Peace and will feature a world map as well as the word Peace in 30 different languages. Students will choose from many different cover paper options and can personalize their colophon with a variety of messages. The Tunnel Book will look like a package and can be themed with many different options. Imagine giving this lovely little package and the delight your recipient will have when they open it to reveal a three dimensional scene! I will also give students instructions with step-by-step photos so they can continue to make this style of book easily after the workshop. Since the class is in early December there will still be plenty of time to make holiday gifts! In this five-day intensive, students will learn the fundamentals of blind tooling and gold tooling on leather, focusing on straight lines and using BS glaire to affix the gold. Line-work is one of the most important, fundamental, and versatile decorative techniques used on tooled bindings, and is used in both traditional and contemporary designs. Students will also have time to explore the use of curved lines and decorative tools, as well as “all-over” tooling. A final plaquette will be completed using the techniques covered. This is an introduction for beginners as well as a step forward for those who would like to build on their existing knowledge. The goal of this workshop is to familiarize you with the processes involved and prepare you for future practice. Over this two-day workshop, Leslie will show participants how to solder, stamp and embellish book covers, and how to bind them into a treasured book using Coptic binding - a technique that has been used since the second century. At the same time, she will show students how to coax beautiful prints onto paper for their pages using leaves, heat and water. While we will be dyeing paper during the workshop, Leslie will talk about how the same process can be applied to dyeing fabric, and students will dye a small piece of wool felt to make a bag to hold their book. Skills and handouts provided will arm students to make books of all sizes. Kits will include everything necessary to complete a 6- by 4-inch book similar as shown. Personal photos may be emailed for sizing and printing before the workshop to be used in their covers. Early Enrollment is now closed. Over this two-day workshop, participants will make a wrapped felt book that will be bound together using gathered sticks and a very simple binding. Students will discover the magic of ecoprinting - coaxing beautiful prints onto paper and fabric - for their books using leaves, heat and water. They will also use bits of lace and fabric, beads and stitching to embellish the covers of their books. The skills and handouts provided will arm them to make books of all sizes. Kits will include everything necessary to complete a 6.5- by 5-inch book similar as shown. Delve into the world of papermaking with plants, earth pigments, and natural dyes in this unique workshop. We’ll begin by learning the fundamentals of papermaking (sheetforming, couching, pressing, and drying) through exploration of cotton, flax, hemp, and abaca fibers. We’ll learn techniques for immersion and vat dyeing wet pulps with dyes such as indigo, logwood, and cochineal, among others, for a wide range of colors. Additionally, we’ll learn how to manipulate dyed pulps on the paper’s surface through mark making techniques, as well as how to embed materials between sheets and how to create thin veils to conceal and reveal elements. After our sheets have dried, we’ll further work them through natural processes of rusting, bleaching, and resist dyeing. Through these processes, each sheet will become its own work of art. This elegant binding style uses heavy weight flax (case paper) to create a natural, flexible book. Sewing is exposed, or visible, on the spine edge and requires no adhesive. By manipulating the number of sections in a book and the type of stitch, whether long or link, endless designs are possible. In this workshop, students will have the opportunity to create two unique exposed spine bindings of their own design. We’ll begin by mapping our designs on graph paper and then learn to transfer them to the book itself through deliberate punching and sewing. Additionally, we’ll discuss how buttons and closures can be worked into the design, as well as different styles of cases and wrappers. PLEASE choose anther registration option. Explore double book structures and forms, where two books can be bound together in a variety of ways, and with a variety of techniques. The tête- bêche, or “head to toe” binding, incorporates two texts that share a spine with no back cover but two front covers, instead. The dos-à-dos binding (“back to back”) and the French door binding (“side by side”) both share the back cover board, but in very different ways. These structures provide many options for the binder and book artist, and allow two texts to relate to each other in a variety of ways. In this two day class, we will complete three books: an accordion style tête-bêche binding, the dos-à-dos binding sewn with a link stitch, and the French door structure sewn on tapes. Along the way, we will discuss how each structure can be used to enhance or contrast texts, and how the structure of the book can change the way the texts relate to each other. Prior binding experience is helpful, but not necessary for this class. Fran Kovac is a bookbinder in private practice in Cleveland, Ohio. She has led workshops at Morgan Art of Papermaking Conservatory in Cleveland since 2009. Fran has studied bookbinding with Pamela Spitzmueller, Hedi Kyle, Jim Croft, Julia Miller, Daniel Essig, and Shanna Leino, among many others. Working primarily in wood and metal, Fran often adapts historic binding structures to contemporary applications. This simple, but elegant, binding is one of the contributions to the American Arts and Craft Movement made by the Roycrofters, and you can learn to bind your own in this one day class. The simple suede cover, over a basic stitched textblock, is finished with printed or marbled endsheets on thin interior boards, while the yapped suede edges provide a graceful note to the book. We will create two complete bindings in class, and use the second one to explore decorative techniques consistent with the Arts and Crafts period. We will also examine original Roycroft examples of this structure, and explore the designs of the American Arts and Crafts movement. No bookbinding experience necessary.